Meetings are held every Wednesday morning by Donegal Business Network in the Radisson Hotel at 6.45 am where over 20 members gather to mix and mingle and refer business with other members and visitors. Ask any members for an invitation and come along to see what is happening so early on a Wednesday morning. 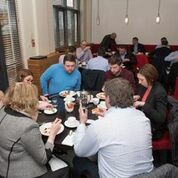 You can enjoy a hearty 4* Breakfast and network with the early birds, who provide first class business networking in Letterkenny.